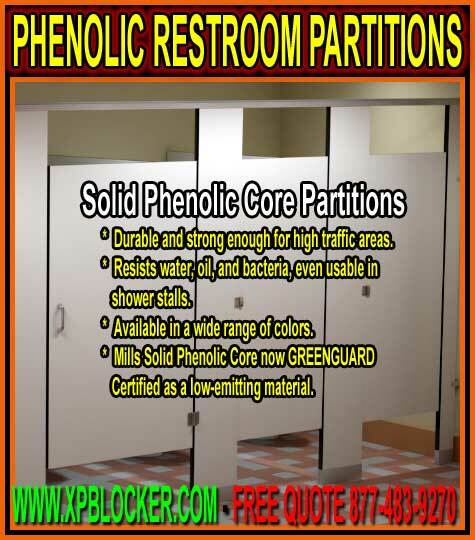 Solid phenolic core partitions have a lot of similarities with solid plastic partitions. They are both very durable and resistant to vandalism, scratching, and graffiti, making them an excellent choice for high-traffic facilities open to the public. Their high resistance to moisture means they’ll hold up well in high-humidity facilities also. They are both GREENGUARD Certified as low-emitting materials, and so both are smart choices if your building with eco-friendliness in mind. In fact, for a lot of people, given the strong similarities between solid phenolic restroom partitions and the lower-cost solid plastic restroom partitions, it seems like a no-brainer to opt for solid plastic for your building project. While it’s true that phenolic restroom partitions cost a bit more, there are many advantages to the material that may make it a worthy pick for your building project. Contrary to what some may think, solid phenolic core is not the same in material or manufacture as solid plastic. Whereas solid plastic is made from an advanced formula of high-density polyethylene, solid phenolic core is composed of cellulose fibers that are resin-impregnated. Decorative melamine surfaces are fused to either side of the core under high pressures and high heat. This results in being the strongest material that we have to offer, in the form of a highly durable surface that is very hard and impact-resistant. The high durability of solid core phenolic partitions leads to low maintenance costs and a low replacement factor that can offset the higher initial cost. This can make them ideal for such high-traffic areas as airports and bus terminals, which see a continuous stream of users of all walks of life throughout the week. Often restrooms in such locations experience a high level of vandalism and reckless unsanitary use, and the level of attention paid to keeping the facilities clean is disproportionately low. These facilities can see phenolic restroom partitions as an advantage: despite the high initial cost, phenolic’s excellent resistance to vandalism, moisture, and bacterial will mean very little need to replace once installed. The anti-microbial properties of phenolic that would be useful in public transport terminals is also a very important consideration in healthcare facilities. Infection control is a major concern for these buildings. Because phenolic restroom partitions are also highly anti-microbial, they are a good addition to any hospital or health clinic, where both visitors and patients of every kind will be using restroom facilities. Phenolic would be an excellent choice especially for large, regional, high-profile hospitals that want the durability and anti-microbial benefits of phenolic and that have the funds to utilize them. Because solid core phenolic partitions don’t absorb moisture or oil, delamination won’t occur with these panels. In fact, shower stalls can be manufactured out of this material because of its excellent performance under wet conditions. Water parks that draw large crowds with many children, as well as community pools, will benefit from this feature of phenolic restroom partitions. Locker rooms, especially those that share a space with showers, are a suitable location for phenolic restroom partitions. Phenolic core partitions are versatile in other ways as well. They are available in a large array of color/pattern choices for a perfect match with the overall design of your building. Depending on your building’s construction, all four popular mounting configurations are possible: Overhead-Braced, Floor-Braced, Ceiling-Hung, and Floor-To-Ceiling. With our current growing economy, the building industry is enjoying an increase in productivity. Factories are trying to keep pace with the client orders that are flooding in for their products and services. It’s an understatement to say that lead times are a crucial aspect of the construction process. In fact, it’s the number one concern when selecting and purchasing restroom partitions for your project, whether they be a budget-conscious choice like Powder Coated Steel or more a high-end selection like Solid Phenolic restroom partitions. At XPB Locker, we know how important it is for you to stay on schedule with your building project to meet your set completion date. We understand these realities and works with a variety of factories to guarantee the best lead times. Balancing functionality, budget, and maintenance, we help you choose the right materials and mounting style for your application with the help of any information or project drawings you have. We can review your drawings and in turn create detailed drawings of restroom layout, partition locations, and specs on how to mount. This results in a process that wastes no time in getting you the restroom partitions you need for your project, when you need them.